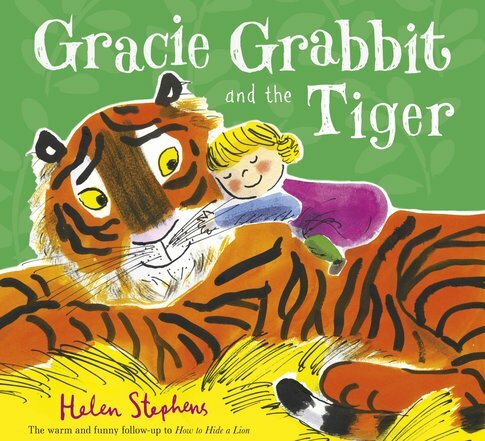 Did you love Helen Stephens’ cute picture book, How to Hide a Lion? (If you’ve not read it yet, you really must.) Well, now it’s time to hug a tiger! Just follow Gracie Grabbit to the zoo. This curious little girl can’t wait to see all the animals. There’s just one teensy problem: her dad is a naughty robber! He’s pinched the penguins’ fish, a baby’s rattle and the elephants’ buns. How can Gracie stop him? Well – this cuddly tiger has an idea! The most iconic tiger since The Tiger Who Came to Tea. The cheekiest robber since Burglar Bill. A picture book with classic appeal: sweet and funny and all-round gorgeous.